If you have been searching for a St. John, IN heating and cooling company, you won’t find a better service than Polar Heating and Air Conditioning. When it comes to price, quality and overall value, the competition doesn’t even come close. We offer homeowners and small businesses in St. John, IN complete HVAC services including the following: Furnace repair, New furnace installation, furnace maintenance, boiler repair, boiler maintenance, new boiler installation, air conditioner repair, air conditioner maintenance, and new air conditioner installation. We also offer complete indoor air quality products and services including air cleaners (purifiers), humidifiers, de-humidifiers, UV lights, air duct cleaning and more. We have thousands of satisfied customers and we look forward to the opportunity to earn your business. We understand that you have many choices when it comes to choosing a St. John, IN HVAC company. Let us prove why we are the best! Contact us today to experience The Polar Difference. 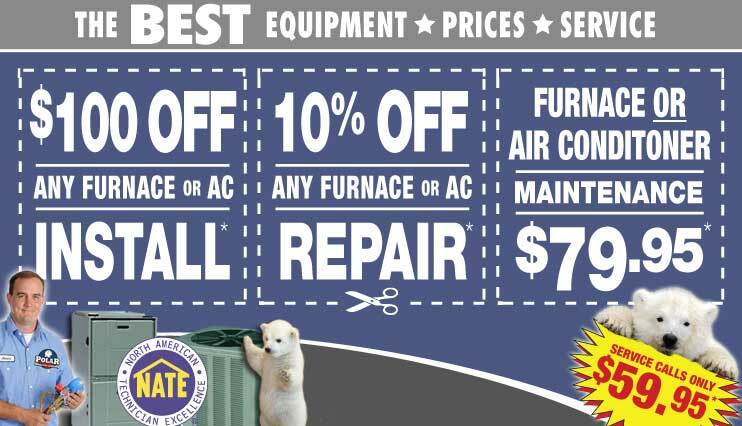 The Nate Certified HVAC repair experts have you covered when you need them. We understand how difficult it can be to find a reputable St. John, IN heating and cooling company can be. At Polar Heating and Air Conditioning, we have the experience, the technicians, and the fleet to handle your furnace repair, air conditioner repair, and boiler repair. Did you already call another company out to look at your unit? If so, we offer a Free second opinion on all repairs if you have a written estimate. At Polar, we stand behind all repair work that we perform. We get the job done right. If for some reason, you are unsatisfied with our service, we will do everything in our power to make it right. We understand that your satisfaction is our number one asset as a company. Trust the experts at Polar to provide you with the HVAC repair service you need at an affordable price. Are you looking to replace your furnace, air conditioner, or boiler in your St. John, IN home or business? If so, Polar Heating and Air Conditioning offers unbeatable pricing on new HVAC installation. Smart homeowners and business owners have chosen Polar for years. Isn’t it time you experienced the service and value that they have? We offer FREE estimates on all new furnace installation, new air conditioner installation, and new boiler installation. When you choose Polar, you can rest assured that you are getting the best price on the best equipment. With brands such as Amana, you will be covered by the strongest warranty protection that the industry has to offer. Not only are parts covered, but we step in and cover the labor for part of the warranty*. It is for this very reason, that no other St. John, IN heating and cooling company can compete when it comes to quality, price, and overall value. Every year, homeowners and business owners in St. John, In should have maintenance and cleaning performed on air conditioners, boilers, and furnaces. Whether your equipment is fifteen years old, or brand new, It is important to service it annually. Annual furnace maintenance, boiler maintenance, and air conditioner maintenance should be performed by a St. John, IN heating and cooling company that employs certified technicians. At Polar, our technicians can clean your unit, inspect it for proper operation, and catch any issues before they become a real problem. Annual maintenance keeps your furnace, air conditioner, and boiler operating at peak efficiency, limits break downs, and usually is a requirement of your warranty. Contact us today to schedule your next visit, or to purchase a maintenance plan to save money.